Bellvue Watson Fish Hatchery. All photos by © Doug Skinner. 2017 Fishing Guide Available Now! The 2017 Colorado Outdoors Fishing Guide is now available! With more that 9,000 miles of rivers and some 2000 lakes and reservoirs, Colorado is truly an angler’s paradise. Get the most out of your time on the water this year by purchasing the 2017 Colorado Outdoors Fishing Guide. Learn techniques for catching mountain whitefish. Discover the monumental fly fishing opportunities of Fossil Ridge Wilderness Area. Read about catching South Park’s trophy northern pike and see a complete guide to fishing Denver metro waters. You’ll find all this and more in the 2017 Fishing Guide. Get your copy today! The 2017 Fishing Guide is a special edition of Colorado Outdoors magazine. You can receive it free with an annual subscription! Urad Lake. Photo by © Wayne D. Lewis/CPW. If you are looking to either fish, hike, see the aspens change, wildlife watch or all of the above, you can do far worse than a trip to Urad Lake. Floating a scenic slice of the Arkansas River through Browns Canyon. Photo by © Scott Willoughby. When it comes to their favorite places to wet a line, fishermen are pretty tight-lipped by nature. So it comes as no surprise that the one-year anniversary of the designation of Browns Canyon National Monument came and went last February with little fanfare among Colorado’s angling community. Besides, nothing has really changed along the scenic slice of the Arkansas River that qualifies among the nation’s premier public trout fisheries. And that’s precisely the point. A Colorado road trip can transport the driver to some remarkable fishing. All photos by Wayne D. Lewis/CPW. Asking a fly fisherman to pick their favorite fly is a lot like asking a mother to pick her favorite child. It’s a question that’s nearly impossible to answer (although, I’m an only child but I’m still not convinced that I’m my mom’s favorite). Most fly fishers, myself included, fill their fly boxes to the brim with hundreds of different flies or “patterns.” Each fly serves a unique purpose and is designed to imitate the various mayflies, caddisflies, midges, stoneflies, scuds and terrestrials that are common to Colorado’s waterways. And combining the “art” of casting a fly rod with the science of entomology (the study of insects) is what makes fly fishing so rewarding. Yet, the endless selection of fly patterns and all the related technical jargon are also the primary reasons why fly fishing can be confusing and even a little intimidating for beginners. 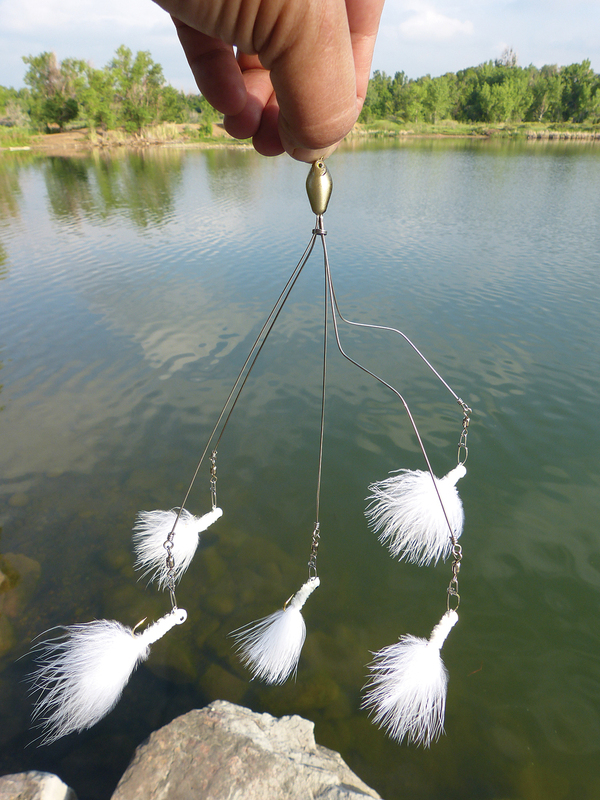 Therefore, in an effort to simplify things a bit, if I was going to pick just one fly to use in all of Colorado’s lakes and rivers, regardless of the time of year or fishing conditions, I’d pick the Woolly Bugger. As I prepared myself to cast the latest and greatest in fishing lures, I realized that no other type of lure has caused me so much thought and contemplation before the initial cast. The rig I was about to cast (especially with bare hooks) was a fearsome looking beast. And what is this magic lure? Those looking to fish for brook and rainbow trout within easy access of I-70 should check out the picturesque little lake at Officer’s Gulch. The lake’s crystal-clear waters are bordered by an easily hiked trail that winds along the banks and through the trees. Ample parking and its location right off Colorado’s main east-west thoroughfare make this a popular spot. According to the Summit Historical Society, Officer’s Gulch is not designated in honor of law enforcement or the military, but in fact, is named after James Officer, an early day Ten Mile Canyon resident who mined the gulch. Officer’s Gulch is located about midway between the towns of Frisco and Copper Mountain at Exit 198. Standard fishing regulations apply.